First if all, let me say thank you! As of today, January 30, Friday’s Bus is SOLD OUT. If you have questions about whether or not you have a reservation, stay tuned. Check your bank to see if your check has cleared; I have only cashed the checks of those with confirmed spaces. If I receive additional reservation requests going forward, I will contact you personally to inform you that there is no additional space. Join the group at 8 am on Friday, at the Visitor’s Center. At that time, I will know of any cancellations, and will let folks know if there is additional space. Even if there is not space, you can still follow the bus in your personal vehicle, and meet us when we stop for interpretation. We will be spending a lot of time dismounted on the Resaca battlefield, so you will still be able to enjoy the stylings of Mr Jim Ogden and my own, less articulate contributions. Saturday is of course, free and open to all. this is the earliest we have ever filled the bus, and I am grateful for everyone’s continued interest in the group. With those words, mounted troopers from the 10th Confederate Cavalry pounded back into the morning sunlight of the fields around Jay’s steam Sawmill, disrupting the remainder of Brig. Gen. Henry B. Davidson’s cavalry brigade. The Yanks in question belonged to Col. John T. Croxton’s brigade, advancing through the timber towards Jay’s Mill. The time was approximately 7:30 a.m., September 19, 1863. Though the previous day, September 18, had already seen substantial fighting, and there had already been significant skirmishing prior to 7:00 a.m. on the 19th, this particular encounter has often been erroneously pegged as the “beginning” of the battle of Chickamauga. The Chickamauga Study group has walked this ground many times, and explored many of the stories surrounding that fateful engagement. But there are always more stories. After all, roughly 130,000 men were engaged at Chickamauga. This story is about two of those people – Benjamin F. Hunt and William R. Hunt, both members of Company F, the 1st Georgia Cavalry. They were father and son; Benjamin was 43 at the time of the battle, his firstborn son William, a stripling at 17. The Hunts lived in the small community of East Armuchee Valley, Walker County, in Georgia. According to the 1860 Census they were farmers; Benjamin, his wife Susan, five boys and two daughters. In the 1860s, Armuchee was pretty remote, located in the far southeast corner of Walker County. Today it is still quite rural, and one of the prettiest spots in northwest Georgia – reminiscent of another very scenic locale: McLemore’s Cove. Benjamin F. Hunt enlisted in the 8th Georgia Infantry Battalion as a private, but he was elected to major in May 6, 1862. He then served in that capacity until he resigned on March 30, 1863. Hunt offered no specific reason for his resignation, noting only that “Circumstances rendered it necessary.” Presumably this meant problems at home, though he was absent sick for a time in August 1862. Perhaps it was because his oldest son, William, was also absent from home. William joined the cavalry in March, 1862, despite being only two months past his 16th birthday. This left Susan alone at home with six children, several of whom were still infants or toddlers. Benjamin presumably spent that summer at home in Walker County; where he would have been aware of the looming Union invasion of North Georgia. A man named B. F. Hunt sold a large quantity of oats and 120 pounds of bacon to the Confederate Army that summer, receipted at Dalton and Catoosa, respectively. What is known that he re-enlisted for “three years or the war” on August 4, 1863; joining the 1st Georgia Cavalry, then stationed at Sweetwater Tennessee – about halfway between Chattanooga and Knoxville. He enrolled in Company F, alongside his son, as a private. Benjamin could have just as easily joined one of the home-guard cavalry companies that were being called into service that August, answering the Governor’s mobilization order; several such were organized in Walker County. On September 19, the 1st Georgia was serving in Davidson’s (until recently, John Pegram’s) brigade of Forrest’s Cavalry Corps. Davidson’s command included the 10th Confederate, 1st and 6th Georgia, 6th North Carolina, and Rucker’s Tennessee Legion; all cavalry. Most of the 1st Georgia was dispatched not to face Croxton, but up the Reed’s Bridge Road to deploy as skirmishers against Ferdinand Van Derveer’s Federal brigade. The 1st Georgia numbered about 295 men that day; they suffered 10 identified casualties. 3 men were killed, 7 wounded. Benjamin Hunt was one of the wounded, which proved mortal. He died that night. On September 20th, 17-year old William brought his father’s body home, a 42 mile journey from Jay’s Mill to Armuchee. Susan’s subsequent pension application stated that Benjamin’s body was “pierced through and bloody.” He was buried in the family cemetery in Villanow, Georgia. William survived the war, but by only few years. He died in 1870, aged 24; of consumption. Susan lived until 1899, survived by only 3 of her seven children. Thanks go to Dr. Keith Bohannon for information about the Hunts and the inspiration for this post. Just a quick note – the Study Group now has 36 sign-ups. We are slightly ahead of last year. Don’t forget to send that check! Civil War tourism is often about connections. Certainly it is for me. The field pictured below was taken at Bentonville North Carolina in October, 2016. It is a fairly innocuous image; it could be of anywhere, in any number of states. But I find it a significant place. Here Major Willard G. Eaton of the 13th Michigan Infantry was killed on March 19, 1865, a scant month before Appomattox and Durham Station brought the Civil War virtually to an end. A few skirmishes and an additional surrender or two were still in the future, but the major fighting was over. Eaton, nominally still a major, had been the acting colonel of his regiment since February, and was leading it forward into action at the moment of his death. 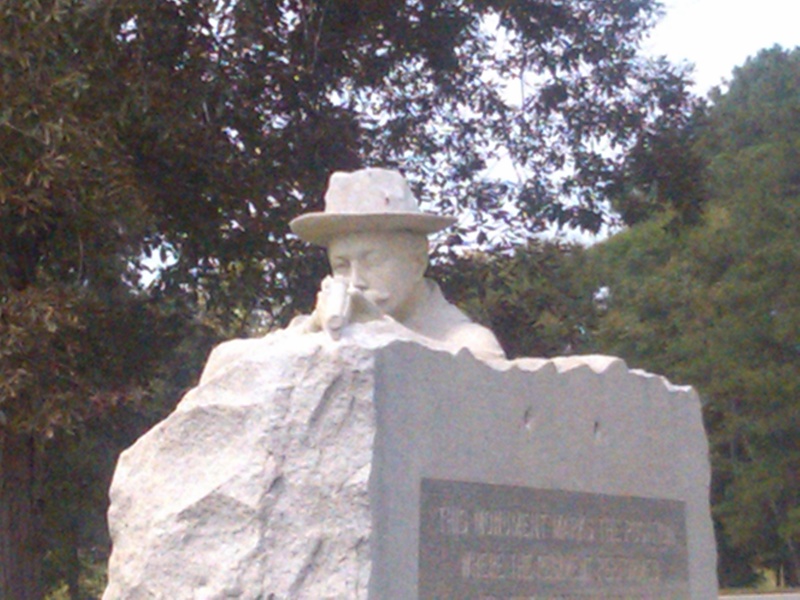 Besides, this blog is devoted to all things Chickamauga. And Chickamauga is where I first met Major Eaton. The 13th Michigan faced a brutal fight in that earlier action; blooded on both September 19 and 20, 1863. They entered the battle on the afternoon of the 19th down in Viniard Field, facing off mainly against Hood’s Texans. They suffered a heavy loss that day, including the wounding of Colonel Joshua Culver. Eaton assumed command. Eaton and his men faced their toughest moment the next day, in Brotherton Field. The 13th Michigan belonged to Buell’s Brigade, of Tom Wood’s division; it was their fate to be caught in the very center of the maelstrom that was the Confederate breakthrough, shortly before noon on September 20. They were not in line. Instead, they were moving to the left, marching in column, with the brigade battery (the 8th Indiana light artillery) just to their west. the 26th Ohio was close by. When struck, the 13th and 26th fronted, and opened fire. the 26th Ohio then began a fighting retreat back through the timber and towards Dyer Field. Eaton and the 13th made a gutsy move. Eaton ordered a charge – directly into the teeth of Bushrod Johnson’s advancing Confederate brigade (currently commanded by Col. John S. Fulton) which outnumbered the battered 13th by a ratio of about four to one. There are plenty of such moments in the war where the men simply refuse to advance, into what looks like the very jaws of death. In this case, that didn’t happen. The 13th followed, 130 bayonets strong, and slammed into Fulton’s ranks. Surprisingly, the Rebels gave ground. Eaton was not indulging in reckless heroics. He had a plan. As Fulton’s men fell back, Eaton ordered the 13th to break off their charge and fall back, firing; emulating the 26th Ohio. the 13th Michigan’s charge bought enough time for both the Wolverine regiment and the 26th Ohio to retreat in an organized fashion. They came to rest on the west side of Dyer Field, supporting a Union gun line. There they would face another desperate fight, outnumbered and almost alone, until they finally were forced to fall back through McFarland’s Gap. 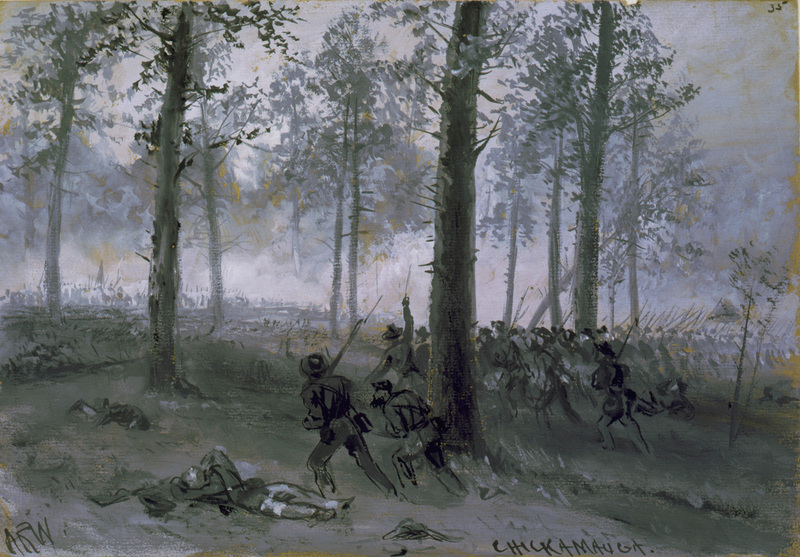 The 13th Michigan took 220 men into action at Chickamauga. Losses were 106 killed wounded or missing. they almost certainly would have been higher (especially in captured) if not for Major Eaton’s cool nerve on the battlefield. As of January 1st, sign-ups for the March 10-11 2017 Chickamauga Study Group are progressing well. We have 21 reserved on the bus, out of 55 available seats. Since we usually get between 45 and 50 attendees, we are nearly halfway. I also note that there are several familiar names who have professed an interest in going, but have not yet signed up. Don’t be Peter Procrastinator, the guy who has to follow along behind the bus in his rental car because he forgot to get his check in on time! Remember, all the money raised outside of necessary expenses (Bus rental and a little photocopying) goes towards preservation or National Military Park needs. Last year the $900 we donated was split between preserving acreage at Dalton through the Civil War Preservation Trust, and contributing to the Friends of the Park’s monument repair fund. Thank you, and see you all soon.